Marchex has been a company that most people have not really understood. With a broad but seemingly independent collection of assets, including VoiceStar, OpenList, IndustryBrains, TrafficLeader, Enhance Interactive and its portfolio of local-vertical domains people have not known precisely where the company was going and what it was up to. Marchex has sought to change all that by bringing together all those components into an single ad network under the brand “AdHere.” The network is performance-based and directed toward both national brands and SMBs. 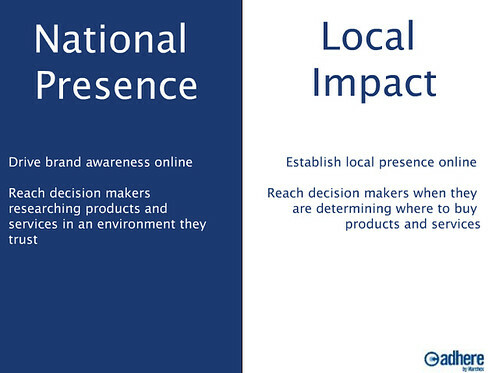 The slogan is “National Presence, Local Impact.” Advertisers may target by site, category and/or keyword. AdHere helps Marchex simplify its messaging and comes at a time when marketers and manufacturers are starting to clue in to the value of the local online marketplace and its ability to drive offline transcations. This entry was posted on June 9, 2008 at 5:46 am and is filed under General online advertising, Local Search. You can follow any responses to this entry through the RSS 2.0 feed. Both comments and pings are currently closed. 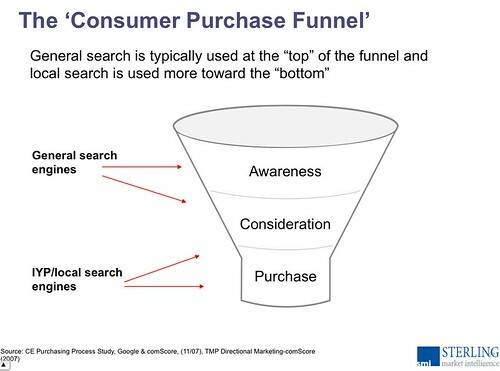 I took the liberty of posting a more modern representation of the “Consumer Purchase” funnel for you Greg: http://www.seeingforests.com/the-buyer-klein-bottle/. Thanks Michael. That graphic is cool. Did you create that? I think that the more local or tageted the adversing is the the better ROI. The essence of web 2.0 is the hyper locality and relevance of information. Yes, but often the ad inventory doesn’t take full advantage of the targeting now available.